I think that daylight savings actually stole time from me instead of giving a few extra hours of light. Lately, I feel like I’ve been scrambling around trying to get things done and my overwhelming “to-do” pile is now as enormous as Santa’s delivery list. Thankfully, I’ve got some clutch recipes like this Clams with Spicy Italian Sausage in my back pocket that I can whip out on days when I’m racing time. Quick and easy recipes that are no fuss, are scrumptious and can be done in no time flat. This surf and turf little beauty can be pulled together in under 20 minutes. YUP! True Story! That’s less time than it would take for me to go and grab some take out. And let’s face it, so much tastier too. 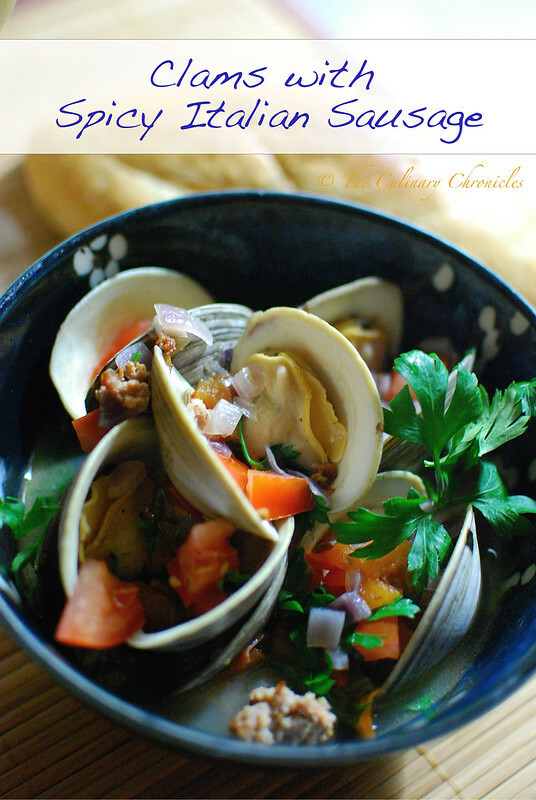 While the Italian sausage browns, you can chop up the necessary aromatics and give the clams a little scrub down. And while the clams are bubbling away in the glorious broth, throw your baguettes (or bread of your choice) in the toaster oven to brown. No time wasted here! The briny clams pair so well with the spicy sausage and the fresh herbs and tomatoes add a brightness and subtle acidity to the dish. And the broth–OH the broth! Quite amazing how much flavor you can get in 20 minutes when you pair sausage, wine and seafood stock. Perfect to dunk your crunchy bread into. Heck–you’ll save so much time on your meal prep that you can take a few moments to sit down and enjoy a glass of vino. After all, you had to open the bottle to deglaze the pot. And with that, have a great weekend, Friends! Heat a heavy bottom pot with the olive oil over medium-high heat. Add in the sausage and use a wooden spoon to crumble up the meat while it’s browning. Once browned, use a slotted spoon to remove the sausage to a plate that has been lined with paper towels to drain. Lower the heat to medium and cook the onions for 1-2 minutes until tender but not browned. Add in the garlic, chili flakes and cook for an additional minute. Turn the heat back up to high. Deglaze the pan with the white wine and use the wooden spoon to scrape up the brown pits. Reduce the liquids by half. Add in the clam juice and once the liquids come to a slow boil, carefully add in the clams, and parsley. Stir in the cooked sausage and cover the pot with a lid. Cook for 4-5 minutes until the clams have opened. Once the shells have opened, remove the clams and divide them between two bowls. Stir the diced tomatoes into the broth. Check the for seasonings and adjust as needed with kosher salt and pepper. Ladle the broth over the clams and garnish with additional parsley. Serve immediately with toasted bread (baguettes or ciabatta).